Fire destroyed a pair of downtown buildings on Main Street in Van Buren Sunday morning with firefighters from multiple communities still dousing the smoldering structures late in the afternoon. Power was shut off to the area as firefighters from Van Buren, Grand Isle, and Limestone and from across the St. John River in St. Leonard, New Brunswick, kept pouring water onto the structures to prevent the fire spreading to neighboring buildings. Town Manager Nancy Troeger said mid-afternoon that she was still “numb” from the news. She said around 3 p.m. that two ladder trucks had been spraying water on the buildings since the fire department arrived shortly after the fire started around 9:30 a.m. Tankers from the Grand Isle Fire Department kept making runs back and forth to get more water from other areas of town for the ladder trucks. The two structures gutted by the fire are known locally as the original Hebert Rexall Pharmacy building and the Ezzy Insurance building. Two tenants living in the apartments above the commercial properties were OK but lost all their belongings, according to Troeger. The Red Cross was called in to assist the two tenants who “lost everything because their homes are gone,” she said. 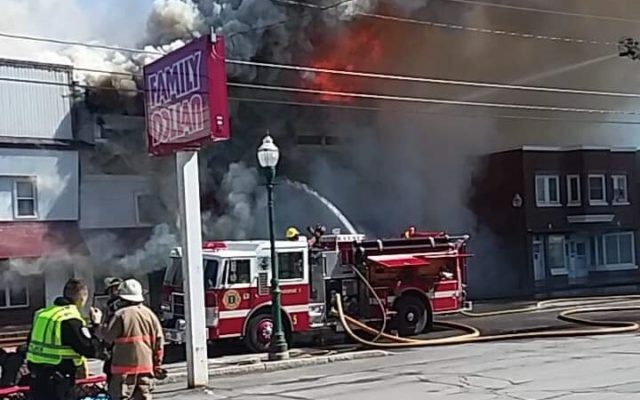 The town manager said the firefighters were working hard to make sure the adjacent buildings were safe and that Main Street would be closed until further notice. She said volunteers had been visiting the site throughout the day to bring snacks, water, and other necessities to the firefighters and first responders.